A man was shot and killed Wednesday outside of an Albany Houses building on St. Marks Avenue between Albany and Troy avenues, police said. CROWN HEIGHTS — A 27-year-old man was shot and killed outside his home in Crown Heights on Wednesday, police said. 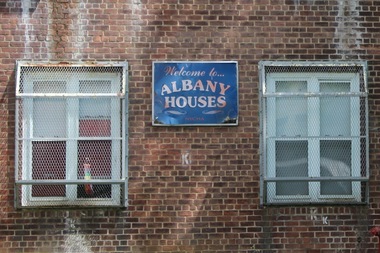 Officers found Ernest Sene at about 8:20 a.m. outside his building in the Albany Houses, 1008 St. Marks Ave., with a gunshot wound to the chest. Sene lived on the 10th floor of the building, located between Albany and Troy avenues, police said. He was immediately taken to Kings County Hospital, but was pronounced dead. A first report of the incident from News 12 Brooklyn said the early morning shooting peppered the housing complex with bullets and that Sene sought help from a nearby deli after being shot. Anyone with information about the shooting is encouraged to call Crime Stoppers at 1-800-577-TIPS (8477). A local anti-violence group, S.O.S. Crown Heights, plans to hold a rally in honor of Sene at the corner of St. Marks and Albany avenues at 6:30 p.m. on Friday "to say 'no' to gun violence," the group said in an online posting for the event.